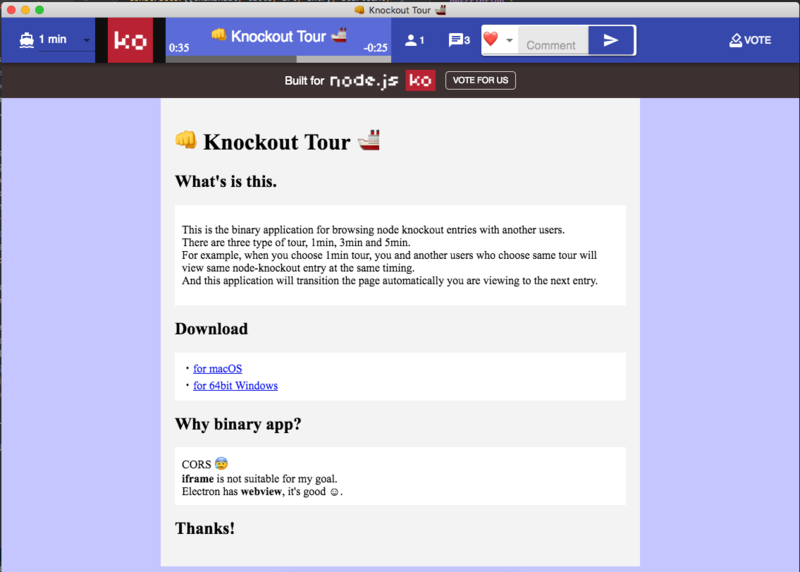 This is binary app for checking node knockout entries with another users. This is the binary application for browsing node knockout entries with another users. There are three type of tour, 1min, 3min and 5min. For example, when you choose 1min tour, you and another users who choose same tour will view same node-knockout entry at the same timing. And this application will transition the page automatically you are viewing to the next entry. Not use browser because this app is binary. 1. Download binary from entry page. 3. Double click binary file, knockout-tour.exe in windows or knockout-tour.app in mac. 1. Input your nickname and choose your tour!! (3min tour is changing web page at interval of 3min). 2. If you like watching entry, let's send comment!! Tour members can see comments from same tourist's. 3 You will check same node-knockout entries with same tourist's!! 1. Dosen't open entry page.